Well the thing that caught my eye first was that it was, of course, the space shutlle and most of us have had a dream of going to space at some point in our lives so being able to build the space shuttle in my house was one of the reasons for my purchase. Also, the end of the space shuttle program was approaching so I thought this would be an iconic set for the end of a great journey. Overall, this is an easily recognizable set and iconic set for an end to an era. There are a few parts that don't come in the colours that are used in this set very often but other than that there aren't very many really special pieces. 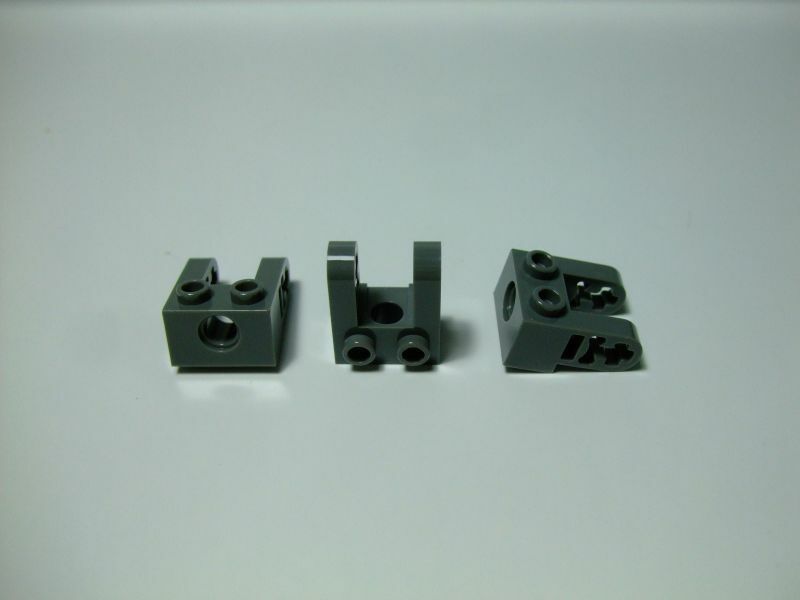 There is a fairly new piece which is the Technic Brick 1 x 2 with Hole and Liftarms (link to picture below). There is also a 32 stud long axel which is pretty unique in my perspective. For the building experience it was fairly good. Building the stand for the shuttle is pretty basic and so is the little camera car. The fuel tank and the booster are a fairly moderate build since there is a lot of repetiton with all of the stacking of the same pieces. The shuttle isn't too compicated and it should be pretty easy to follow along while building. The cockpit area, while building, is pretty simple since it is just stacking sloped bricks. The body of the shuttle is fairly straightforward and it shouldn't cause any major problems while building. There is some sideways building involved while building that part of the shuttle. The back part of the shuttle is also fairly straightforward and you should get through that part fairly quickly. Overall, the build is fun and there aren't very many complicated techniques that should cause you any trouble. For playability the set hase a couple of flaws. First of all, to get the two astronauts into the cockpit you have to do some squeezing because they don't fit in really easily. 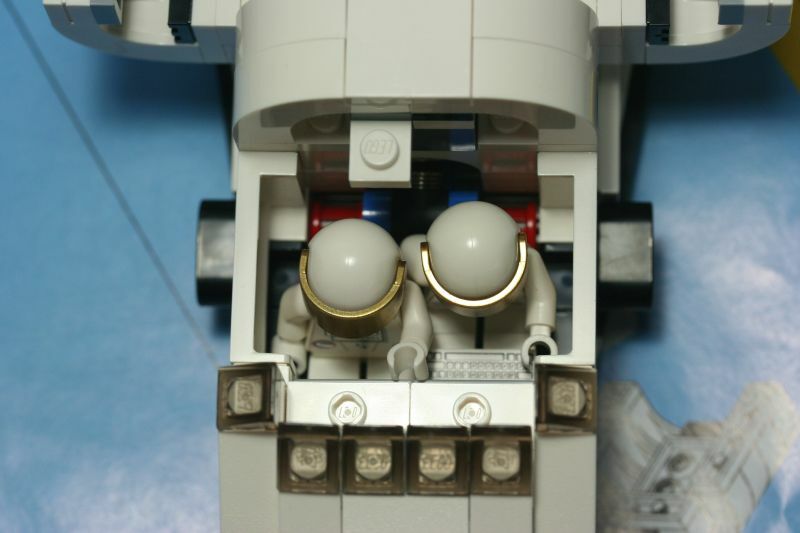 Here is a link for the way they have to be positioned in order to fit (http://www.brickshelf.com/gallery/drspock/shuttle/picture_7358.jpg). Secondly,when you roll the shuttle along the ground with the landing gear out, the landing gear on the front will sometimes snap back into the shuttle so sometimes you have to hold it in place. Lastly, I warn you, when you hold the shuttle and pretend that you are flying it around with the fuel tank on, DON'T HOLD THE MODEL BY THE SHUTTLE!!! You have to hold the model by the fuel tank because the pins that connect the shuttle to the fuel tank are fairly loose. So if you are flying the shuttle parallel to the ground and holding the model by the shuttle then, the tank will disconnect and go crashing to the ground. Other than that it's a good little model to play with since you are able to seperate the booster rockets and the fuel tank just like the shuttle actually does. Also the addition of the Canada-Arm and the satellite let's you play like you were in space. Overall, the set has it's flaws but they are not major and if you follow what I said above, then yu should have fun with it. The price is about 10 cents per piece so it's a fair price for this iconic set and the number of pieces you get. It's not a ripoff nor a steal, it's just a fairly priced set. The sculptures theme has usually appreciated pretty well over time. It has a CAGR (Compound Annual Growth Rate) of about 15%. So this theme grows pretty well year after year. The reason is that the sculptures theme contains iconic sets and people really like that so they buy the sets. Overall, this theme appreciates fairly well over time so I would recommend buying from this theme. This sets is very exclusive because the set was made specifically for the end of the space shuttle program. This means that LEGO probably won't make another space shuttle again (other than 10231-1 which was an updated version of the set). So, as younger generations become older they will want to have this because there probably won't be another LEGO pace shuttle produced again. Overall- This set is very exclusive since it probably won't be produced again. The box looks pretty nice with the set displayed on the launch pad and the nice Shuttle Adventure text in the top corner. There are a few pictures of the set's features with a space background. When opening the box, there are two instruction manuals, a small sticker sheet and 14 plastic bags containing the parts. The bags are not numbered so you will have to dump all of the pieces on the floor and try and find then while building. Overall, the box art loks pretty nice but the bags containing the pieces aren't numbered so that is a let down. This set should grow fairly well over the years because of the theme it's in, it's very exclusive, and the set is of an iconic rocket. This set is a play and a display piece since kids can pretend to fly around with it and it has a display stand to show off the set. It looks very nice when displayed on the dark gray. If someone walked into a room and saw it, it would stick out to them and they would be able to relate to it since this set reflects a very iconic rocket. This set is definitely an impressive set to display since it is a large set so it really stands out in a room. After considering everything I give this set a solid 8. It is a great display piece a will most likely appreciate very well over the years. What brings it down is the lack of exclusive pieces, the build, and the playability. I would definitely recommend buying this, especially if you are a collector and don't plan on building or playing with this set. Overall, this is very good set overall and I would recommend purchasing this as it will most likely get a higher value later on.